Communism by refusing to sync itself with changing realities turned stale and hence failed to serve humanity. No wonder they ended up being rejected all across the world. Division has been the biggest strength of Communism and without this, they would not have survived even a day, said Justice L Narasimha Reddy, Chairman of Central Administrative Tribunal at the book launch function in Hyderabad on 12-Jan 2019. 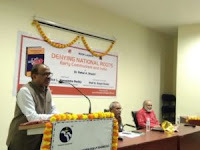 Narasimha Reddy was speaking on the occasion of the launch of book titled “Denying National Roots- Early Communism and India” at the Badruka College Auditorium, Kachiguda mutually organized by Samvit Kendra and Pragna Bharati. Justice Reddy said he never took communism seriously though communism produced some great intellectuals as they diverted all their intellectual prowess towards wrong and negative causes. He remembered China attacked India in 1962 though India which was the first country to recognize Communist China as a state. India even gave up permanent seat in UN Security Council and also conceded its Sovereign claims over Tibet. “Compassion is our culture, but communists filled Indian political space with violence and cruelty”. The book will help us call the bluff of Intolerance/Award-Wapsi Gang, the former Patna High Court Chief Justice, added. Gopal Reddy, Member of UGC and International Political Science Association, gave a brief introduction of the book and said this book presents the contradictions in Communism and cited popular communist slogans such as “Working men have no country but they should raise one”. And how these comrades behave like internationalists when not in power, but turn into Hyper-Nationalists when they taste the power, as we see in China. 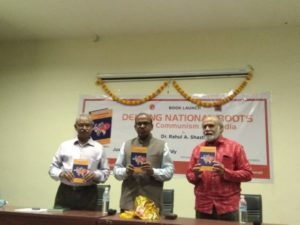 Speaking about the book “Denying National Roots: Early Communism & India”, Dr. Rahul Shastri, the author of the book said the book deals in-depth on the relation between Indian communists and communist parties and Communists International that Bolsheviks had formed in 1919. Communism failed to capture Indian nationalist movement because Gandhi was leading the movement and perhaps he deciphered their designs in advance. “Samvit Kendra” is a Hyderabad based institution with an objective to bring out the original research in the best interests of the nation, especially in the areas of culture and history and their relevance to the current times.